Hope to see you in Gothenburg, in the heart of Scandinavia, in spring 2019! 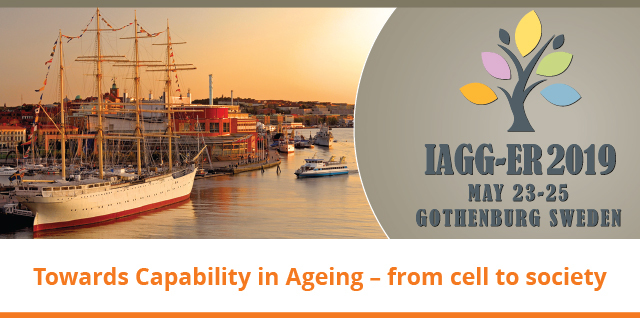 Gothenburg has easy access with direct flights from 60 destinations and only 20 minutes transport from the airport to the IAGG-ER venue in the city center. The congress venue and the city offers great quality at a lower cost. Prices are below European level. Registration fee includes coffee and lunches. We received an overwhelming number of high quality symposia proposals before symposia-deadline. That makes us convinced that the scientific program will cover all disciplines, themes, and major subjects within gerontology and geriatrics. Please help us to announce the congress wherever you are! Sweden MEETX använder BizWizzard som plattform för e-postmarknadsföring av kongresser och möten. Den kontaktinformation vi har lagrad om dig i detta system kommer endast att användas för epostmarknadsföring av vetenskapliga kongresser och möten. ****** Sweden MEETX uses BizWizzard as our marketing automation platform. The personal data stored in this system will only be used for sending e-mail marketing information about scientific congresses. You can at any time request to see all the information we have stored about you by filling in this form and sending it. Then you will receive a mail containing a temporary link to your personal receiver page.